• Client means the person, or Company buying the goods from the South London Electricians. • Products and/or services mean the products and/or services being purchased by the Client from the South London Electricians. • Contract means the contract between the South London Electricians and the Client for the purchase of the goods. • Date of the contract means where the contract arises from a quotation given by the South London Electricians, i) the date of acceptance of the order by the South London Electricians; or ii) Where the contract arises from a quotation given by the South London Electricians, the date upon written notification of acceptance of the quotation is received by the South London Electricians. • Contract price means the price of goods as agreed between the Client and the South London Electricians. • Person includes a corporation, association, firm, South London Electricians, partnership or individual. Quotation shall mean price on offer for a fixed term. Manager is the companies appointed decision maker. The Client may request a Quotation from the South London Electricians setting out the price and quantity of the Goods to be supplied. If the Quotation is acceptable to the Client, the Client may place an order within an acceptable timeframe. If any instruction is received by the South London Electricians from the Client for the supply of products and/or services, it shall constitute acceptance of the terms and conditions contained herein. Upon acceptance of these terms and conditions by the Client, the terms and conditions are definitive and binding. These terms and conditions and any subsequent terms and conditions issued by the South London Electricians shall apply to all orders for the goods and the services made by the Client after the date and time at which these conditions are first delivered or sent by email or facsimile to, or otherwise brought to the notice of, any employee, staff member or representative of the Client. It shall be the Client’s responsibility to ensure that these conditions are promptly brought to the attention of the appropriate staff of the Client, and accordingly any order made by the Client after the date and time described above in this clause shall be deemed to be an acceptance of these conditions. 5.2. The Price shall be the Price of the South London Electricians’s current Price at the date of delivery of any goods. 5.3. Time for payment for the products and/or services shall be of the essence and will be within 7 days time frame unless otherwise stated on the invoice, quotation, tender documents, work authorisation form or any other work commencement forms. If no time is stated then payment shall be due on delivery of any goods. 5.4. The Client agrees that the cost Price shall be determined by the South London Electricians, and shall take into consideration “one-off” costs such as design and production. 5.5. In some cases, prices can only be calculated after a site visit. 5.6. The South London Electricians reserves the right to ask for a deposit and implement a surcharge for alterations to specifications of products after the order has been placed. Client might also have to pay upfront for certain services owing to distance and time of job. 6.1. The method of payment will be made by cash, or by bank transfer, or by any other method as agreed to between the Client and South London Electricians. 6.2. Subject to any provision to the contrary in the Contract, payment (being cash unless otherwise arranged in advance and confirmed in writing shall be received within 7 days of the South London Electricians’s invoice to the Client, which shall be issued promptly on or after delivery of the goods. 6.3. All payment for work under £500 exclusive of VAT are paid on completion of work. 6.4. Without prejudice to any other remedies the South London Electricians may have, if at any time the Client is in breach of any obligation (including those relating to payment), the South London Electricians may suspend or terminate the supply of Goods to the Client and any of its other obligations under the terms and conditions. The South London Electricians will not be liable to the Client for any loss or damage the Client suffers because the South London Electricians exercised its rights under this clause. d. the South London Electricians shall be entitled to cancel all or any part of any order of the Client that remains unperformed in addition to, and without prejudice to any other remedies; and all amounts owing to the South London Electricians shall, whether or not due for payment, immediately become payable. 7.1. The South London Electricians reserves the right, at our sole discretion, to refuse or cancel any order. If customer’s order is cancelled after his/her credit card has been charged, the said amount will be refunded to the credit card account. 7.2. In case the South London Electricians receive a cancellation notice from customer and the order has not been processed by us, South London Electricians shall cancel the order and refund the entire amount to the customer within a reasonable period of time. South London Electricians will not be able to cancel orders that have been processed or where the ordered products are already shipped. Deposits might be forfeited. These Terms of Payment will be interpreted in accordance with applicable United Kingdom legislation, which will have exclusive legal jurisdiction over any dispute in relation to the products and/or services or these Terms of Payment. The South London Electricians will endeavour to resolve any dispute between the Client and itself without the need for Court proceedings. Any such attempt is without legal prejudice. Ownership and title of the goods remains with South London Electricians until the purchased price and all other monies owing by the Client, under the contract or any other contract to The South London Electricians, have been paid in full. South London Electricians reserves the right to remove any parts from the site if payment has not been settled. The South London Electricians warrants that it will repair or make good any defects in the goods, if written notice of the claim is received by the South London Electricians within seven (7) days from the date the goods were delivered. No claim shall be accepted under such warranty if any attempt to repair the defective goods is made by any person not authorised by the South London Electricians, or if the defective goods have been modified or incorrectly stored, maintained or used. 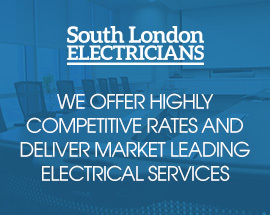 If the South London Electricians elects to repair or replace any defective goods, such work shall be undertaken at such place as the South London Electricians may reasonably specify and the Client shall be responsible at its cost and risk for shipment of the defective goods to the place specified. Labour carries 12 months guarantee on installed products. Products guarantee varies depending on supplier. The warranty is designed purely for individual private homeowners and shall cover most jobs between £250 and £50,000. The insurance cover shall last for at least six years. The South London Electricians shall not be liable for any loss of any kind whatsoever suffered by the Client as a result of any breach of any of the South London Electricians’s obligations under the contract, including any cancellation of the contract or any negligence on the part of the South London Electricians, its servants, agents or contractors, nor shall the South London Electricians be liable for any loss, damage or injury caused to the Client’s servants, agents, contractors, Clients, visitors, tenants, trespassers or other persons. The Client shall indemnify the South London Electricians against any claim by any such person.